Temperament: The Doberman is a watchful, alert, determined, fearless, loyal and energetic dog. Family Dog: The Doberman is a noble, loyal and affectionate dog. They are a very devoted breed that loves to be close to the family. Doberman's require an owner that is able to provide them with proper discipline without being fearful. It is very important for all members of the family to learn how to handle the dog correctly as they tend to be pushy if they do not have proper obedience and discipline. Dobermans can make great family pets if properly raised with children from puppyhood. Shedding: Doberman Pinschers are average shedders. Grooming: Dobermans require very little grooming. Training: The Doberman is a highly intelligent dog that is easy to train. Females tend to be a bit more stubborn to train than do males. They should be thoroughly socialized when a pup to prevent their natural protective tendencies from becoming too strong. It is important that the Doberman has proper mental stimulation to keep them happy. Weather: Doberman Pinschers are very sensitive to the cold and should not be left outside in that weather. Exercise: The Doberman Pinscher is an extremely energetic and should have daily exercise including a long walk, jog or run. Living Conditions: The Doberman can be a good apartment if given ample time for exercise every day, but it is recommended that they have at least an average-sized yard. 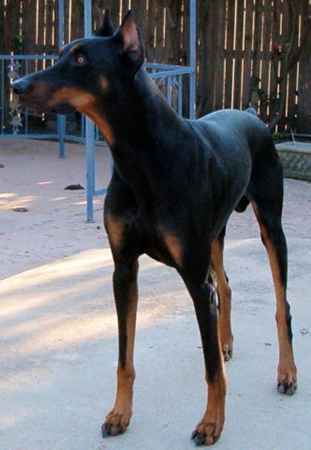 Appearance: The Doberman Pinscher is a medium-sized dog with a square, compact, muscular body. They have a noble and elegant appearance. Size: A male Doberman Pinscher is between 26 to 28 inches high at the withers, while a female is between 24 to 26 inches tall. Their average weight is between 66 to 88 pounds. Head: The Doberman Pinscher's head is long and dry with a wedge shape to it. The head becomes gradually becomes broader as it approaches the base of the ears. The top of the head is flat with a slight stop as it approaches the muzzle. The cheeks are muscular and flat. The Doberman's lips lie close to the full and powerful jaws. Nose: The nose of a Doberman Pinscher should be solid black in dogs with a black coat, dark brown in red-coated dogs, dark gray in blue-coated dogs and dark tan in dogs with a fawn coat. Eyes: The Doberman Pinscher has moderately deep set, almond shaped eyes giving him a vigorous, energetic expression. The iris is uniform in color and can range from a medium to dark brown in black-coated dogs lighter colors matching the coat markings in red, blue and fawn coated Dobermans. Ears: The Doberman Pinscher's ears are typically cropped and held erect. If left uncropped, the ears have a rounded appearance like a hound. When erect, the upper portion of the ear is level with the top of the skull. Muzzle: The muzzle Doberman Pinscher extends parallel to top of the head. Teeth/Bite: The Doberman has 42 very strong, white teeth meeting in a true scissors bite. Neck: The Doberman's neck is dry and muscular with a moderate arch as it widens toward the shoulders. The length of the neck should be well-proportioned to size of the head and body. Body: The length of the Doberman Pinscher's body is approximately equal to its height to the top of the well pronounced shoulders. The back is wide, short and firm extending in a level line from the shoulders to the rump. The chest is broad with a well-defined forechest, well-sprung ribs which are flattened at the lower point to allow proper elbow clearance. The brisket extends to the elbows. The underline is well tucked up. The loins are wide and muscular. The Doberman's hips are approximately the same width as that of the body at the rib cage and shoulders. Forequarters: The shoulder of the Doberman Pinscher slopes forward toward the ground at a 45 degree angle meeting the upper arm, which is approximately equal in length, at a right angle. The elbows, which are located at approximately half the height of the dog are close to the body both when in motion and at rest. When viewed from either the front or the side the muscular, heavy boned legs appear perfectly straight and parallel to each other. The pasterns are firm and form almost a right angle to the ground. Hindquarters: The angulation of the hindquarters balances the forequarters. The hip bone descends from the spine at an angle of 30 degrees, giving the dog a slightly rounded croup. The hip meets the long, broad and muscular upper shanks at right angles. The stifles are clearly defined. The length of the upper shank is approximately equal to that of the lower shanks. While at rest, the hindquarters are perpendicular to the ground. When viewed from the rear, the legs appear straight and parallel to each other. They are far enough apart to give the body a proper build. Gait: The Doberman has a free and balanced gait with the forequarters having good reach and the hindquarters providing powerful drive. The front and rear legs move in line. The legs should never be thrown neither in nor out as a dog with proper build will single-track. While in motion the back remains firm and strong. Feet: The feet of the Doberman Pinscher face straight forward, are well-arched, compact and catlike. The Doberman Pinscher's front dewclaws may be removed while the rear ones are generally removed. Tail: The Doberman Pinscher's tail which appears to be a continuation of the spine should be docked around the second joint, although lately some groups of breeders have begun leaving the tails natural. The tail is carried just slightly above the horizontal line of the back when the dog is alert. Color: The coat of the Doberman Pinscher may be black, red, blue or fawn with sharply defined rust markings locate above each eye and on the muzzle, throat, forechest, legs, feet and below the tail. There may be a small white patch found on the chest. Coat: The Doberman has a short, hard, thick, smooth coat that lies close to the body. There may be an invisible gray undercoat on neck. Life Expectancy: The average life expectancy of a Doberman Pinscher is up to 13 years of age. Characteristics: The Doberman Pinscher is an alert, energetic, fearless, loyal, obedient and determined dog that has been bred as a guard dog for at least a century. The Doberman Pinscher is a very energetic with excellent strength and stamina. They are classified as a very aggressive dog which is not necessarily the case as most are big, protective babies. Dobermans make great therapy, tracking, guarding, police, military, search & rescue, competitive obedience, schutzhund and watch dogs. Some Dobermans have a tendency to bond to only one person. They have been bred to work and need daily human interaction, not to be left in the yard all day. Health: The Doberman is a generally healthy breed. They have a tendency toward cervical spondylitis or wobbler syndrome which is caused by fusion of neck vertebrae and compression of spinal cord, Von Willebrands disease, and obesity, bloat, hip dysplasia and congenital heart disorders. It is recommended that you have the puppy checked by a Veterinarian before purchasing him. History: The Doberman Pinscher, which was developed in Germany during the 1860s by a German tax collector named Louis Dobermann, was created by crossing German Pinschers with Rottweilers, Beauceron, Pinschers, Manchester Terriers, Greyhounds and English Greyhounds. He created the Doberman because of his need for a watch and guard dog on his frequent trip through bandit-infested areas. The Doberman was presented at its first dog show in 1876 where it became an immediate success.